When the Malaysian currency tanked in late 1997, the country's then-prime minister, Mahathir Mohamad, said he had "definite information" that Jews were the cause. "We do not want to say that this is a plot by the Jews, but in reality it is a Jew who triggered the currency plunge, and coincidentally [financier George] Soros is a Jew." Mr. Mahathir went on to say that just as "the Jews would rob Palestinians … this is what they are doing to our country." Mahathir's antisemitism is so typical of discourse in the Muslim world over the last generation that I have found an "uneasy parallel" between it and Nazi Germany of the 1930s. This background makes clear the historic nature of a speech by the president of Pakistan, Pervez Musharraf, to the American Jewish Congress on September 17. More coincidentally, he too singled out George Soros as a symbol of Jewish financial prowess, but very differently. Lauding Jewish groups in the United States, Mr. Musharraf remarked that they "were at the forefront in opposing the ethnic cleansing of Muslims in Bosnia," adding: "I am told that the largest contributor to the Bosnian cause was the Jewish-American businessman and philanthropist, George Soros." Most news coverage of the Musharraf speech focused on the prospect of Pakistan opening diplomatic relations with Israel (Reuters: "Pakistan leader urges US Jews to help make peace"), but what is potentially of lasting importance about the Musharraf address – beyond the mere fact of its being delivered to a Jewish organization – was the president's respectful, accurate, and constructive comments about Jews. He began with the important observation that Jews and Muslims "have many similarities and few divergences in their faith and culture," then listed three specifics: belief in the oneness of God, shared ways of greeting, and a common phrase in the Talmud and Koran. And Moses, he pointed out, is the prophet most often referred to in the Koran. Mr. Musharraf noted how "our experiences and histories intertwine" and then elaborated on what he called the two communities' "rich and very long" history of interaction. He mentioned the "shining examples" of Cordova, Baghdad, Istanbul, and Bukhara, the golden period of Muslim Spain, and the joint experience of the Spanish Inquisition. Generalizing from the inquisition, he correctly asserted that Jews and Muslims "have not only lived together and shared prosperity, but also suffered together." Against this background, Mr. Musharraf portrayed the period since 1945 as an aberration. As I have also noted, 1945 was the pivotal year when Jews stopped leaving Christendom for Islamdom and reversed directions. The past six decades, in other words, broke a pattern of 13 centuries. Mr. Musharraf resisted ascribing blame for this gulf but limited himself to noting that the problems occurred during the "bloodiest century in human history." He commended American Jews for their role in protecting Bosnian Muslims and praised them for offering "legal and other assistance" to Muslims in the United States. "I wish to acknowledge and appreciate this," he said. Mr. Musharraf also flattered Jews as "probably the most distinguished and influential community" in America. Looking to the future, he emphasized the role of compassion in repairing Muslim-Jewish relations. Properly to appreciate the significance of this speech means hearing it with Muslim ears. It may not sound like much, for example, that he referred to the Holocaust as the Jewish people's "greatest tragedy," but the profusion of Muslim Holocaust deniers, including Palestinian leader Mahmoud Abbas, makes this an important statement. Mr. Musharraf's speech can significantly affect Muslim views of Jews only if it is part of a larger effort. So, in the question period, I asked him if he would take steps to ensure that his vision of Jews be spread. He admitted he had not thought this through but on the spot there, in public, in view of a bank of television cameras, he made a commitment to do precisely that. Mr. Musharraf's reaching out to Jews is part of a much broader project of developing what he calls "Enlightened Moderation" in Islam. Although until now more talk than action, even the talk is a major achievement. Sadly, only he and one other Muslim leader, King Abdullah II of Jordan, are articulating a moderate version of Islam, but at least those two are doing so. For his efforts, Mr. Musharraf deserves appreciation and encouragement. 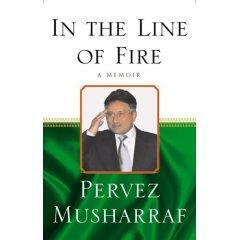 Pervez Musharraf's book, "In the Line of Fire." Historically, Pakistan has always championed the Arab and Palestinian cause. Our stand against Israel has been confrontational. Interaction with Jews or the Jewish state has been taboo. We have been more pious than the pope on the subject of the Palestinian-Israeli dispute, given that we are not Arab and that quite a few other Muslim countries, including Arab countries, have recognized Israel, at least to some degree. I have always wondered what we stand to gain by this policy. It is a given that Israel, besides being the staunchest ally of the United States, has a very potent Jewish lobby there that could wield influence against Pakistan's interest. Moreover, if the intention is to strengthen and promote Palestinian rights, I thought more could be contributed through joining the dialogue rather than remaining on the sidelines. The change that has occurred in the political realities of the Middle East and the world after the end of the Cold War, and after 9/11, suggested to me that it was time to reconsider our policy toward Israel. I am aware of the sensitivity of this issue, domestically and in the Arab world, and I realize that we must tread carefully. I tested the domestic ground first, by giving a careful statement that if Israel moved forward toward the creation of a viable state of Palestine – a state acceptable to the Palestinians – then Pakistan would reconsider its diplomatic stance toward Israel. As I expected the media and the intelligentsia reacted very positively, whereas the man in the street could not have cared less. I was then approached by some representatives of the American Jewish community led by Jack Rosen, president of the American Jewish Congress, to address the Jewish community in New York. It didn't take me long to agree. Simultaneously, we saw discernible changes in the attitude of Israel's Prime Minister, Ariel Sharon, toward the Palestinian dispute. He started the forced removal of Jewish settlements' from Gaza. When I saw this on television, I immediately sensed an opportunity. I thought the foreign ministers of Pakistan and Israel would meet overtly. We considered Turkey the best venue for such a meeting and also thought that the good offices of the Turkish prime minister could be used to arrange it. It took just one day to organize all this. The Israeli's eagerness to respond was very clear. My gratitude went to my friend the prime minister of the brotherly host country Turkey. The historic, groundbreaking meeting of the foreign ministers of Pakistan and Israel took place on September 1, 2005, in Istanbul. It was positive and was followed by my address to the American Jewish Congress in New York on September 17, 2005. The atmosphere was electric, and the reception given to me was very warm and welcoming. All the prominent figures in the American Jewish community were on hand. I met every one of them before the formal ceremony. This was a very big first: a Pakistani leader mixing with and then addressing the American Jewish community. The ceremony started with the Jewish ritual of breaking bread. Jack Rosen praised me in his opening speech. Congressman Tom Lantos read out and then presented me with a framed copy of the congressional Record of the House of Representatives titled "Tribute to President Pervez Musharraf of Pakistan." My own speech was emotional, and I think it had the desired impact. New ground was broken. The domestic reaction was all positive, and the international response euphoric. Following the PLO's recognition in its charter of Israel's right to exist, Pakistan now accepts Israel as a Jewish state and de facto reality, but at the same time stands by its commitment to support a viable and independent Palestinian state that is acceptable to the Palestinian people. Related Topics: Antisemitism, South Asia | Daniel Pipes receive the latest by email: subscribe to the free mef mailing list This text may be reposted or forwarded so long as it is presented as an integral whole with complete and accurate information provided about its author, date, place of publication, and original URL.